The flow management of a location controls outgoing trains and is very well suited to manage hidden yards: The minimal occupancy grants the yard remains partly filled while the FiFo option allows the trains to exit alternately. It has to be ensured the trains have to stop in the location. The wait option of all blocks covered by the location has to be enabled (see Block General). The block type should be set to Others (see Block Details). The Mainline Block option must be disabled. 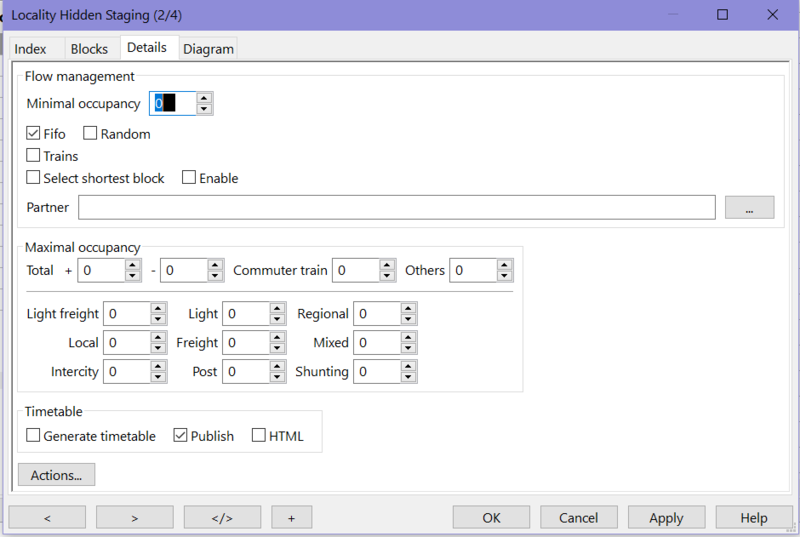 Setting this option to values greater than zero will activate the location flow of trains. No train is allowed to depart if the number of trains is lower than this value. Only if the number of trains in the location is equal or greater than this value a train is allowed to exit the location. If there are staging blocks in the location, all trains in staging blocks are counted. 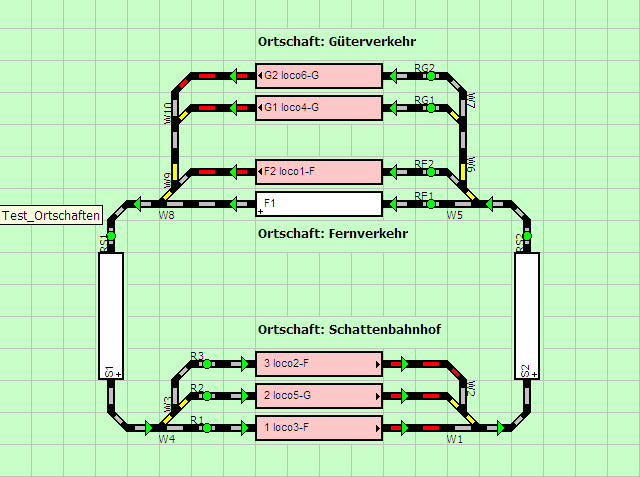 With hidden stations this allows to control the amount of traffic on the layout: If in a hidden yard consisting of five tracks four trains are always to remain the value has to be set to five (a train is allowed to depart not until five trains are in the yard). Rule of thumb: Number of trains to remain in the yard plus one. The maximal reasonable value is equal to the number of tracks in the yard. or the auto mode has to be switched off and the train has to be controlled manually, e. g. by means of a Rocrail throttle. If the train is in auto mode already a single start command from the context menu will start it. If the train is not in auto mode, the first start command will set it in auto mode and a second start command will allow it to depart. Schedules may be used together with flow management. However, the Time Processing of the respective schedule should be set to Relative as the flow management takes priority over the schedule's departure times. If a train has already received the exit permit, but has not yet left the block, he is no longer counted in the minimum occupation. Even if only because the minimum occupation of the location - seemingly - would be given no other train can drive out. In conjunction with Minimal Occupied (see above) this option will allow departing trains to regard the "First in, first out" rule. If the FiFo option is activated trains do depart in strict rotation. This can only be overwritten with a train (re)Start command (see also Minimal Occupied above). All trains in this location must be in automatic mode to enable flow and to prevent a deadlock situation. Remark: After a restart the Fifo will be initialized; the order of entering before the restart is not preserved. Remark: There is no FiFo without a Minimal Occupied greater than zero. Timetable Dialog Formated in HTML. Plain text. Destinations must be real blocks. The regular stops must have a depart time set. 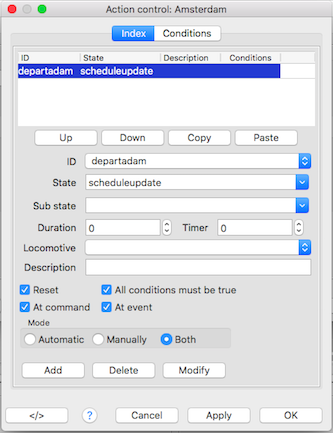 Generate a timetable on the fly in RCP format. This is also for use with MQTT and Node-RED. 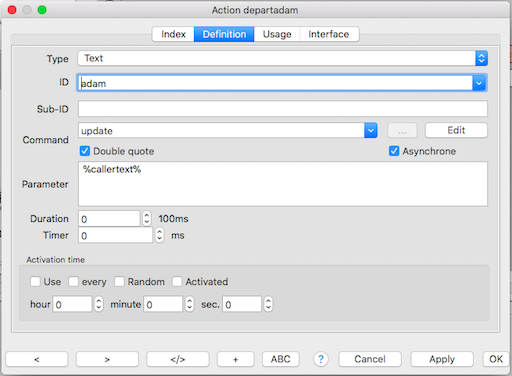 In case of actions the %callertext% variable will be set with plain ASCII or HTML. Publish the timetable to all clients. Format the timetable in HTML for actions. The receiving text object should have the HTML option enabled. %calleruserdata% = Depart time including delay. %callertext% = The via blocks and final destination. Location 1 has FiFo active and minimal occupancy 3. Location 2 has FiFo active and minimal occupancy 2. Put Rocrail in automode and start all locos. Location “Schattenbahnhof” has FiFo active, minimal occupancy 3, permission nothing chosen. Location “Fernverkehr” has FiFo active, minimal occupancy 2, permission of type “Intercity”. Location “Güterverkehr” has FiFo active, minimal occupancy 2, permission of type “Freight”. With the XMLScript command "info" an overview of a location can be set in a Text object. All loco's are checked if they have a schedule assigned, and the schedules will be scanned if blocks are in it for the selected location.